On 16 September I ran my second half-marathon of the year: the Maidenhead Half-Marathon and whilst not my first choice of the type of race I like to do, it turned out pretty well. Given the improvements I've seen in my 5k, 5 mile and 10k times, I wanted to do a nice flat half-marathon so I could see how I'd improved on my half-marathon time in the months since I ran the Reading half-marathon on 1 April. When hunting around, I discovered the Maidenhead half, which seemed to tick all the boxes: it was flat, close to home, a half-marathon, 5 months after my last half, no clashes with other races and in an area I'm familiar with. So I entered the race. Now when I originally entered this race, the details of the route were unclear and I was under the impression they'd use the same route as they did in 2011. This wasn't the case and as we got closer to the event, I discovered the new route was a multi-lap race rather than the single lap route they used in 2011. I'm not a fan of multi-lap races, especially longer races, as I get a bit bored and a bit demotivated on the subsequent laps - I think I perform much better when I don't know what's coming. But as I'd already entered and you can't get refunds, I went ahead and ran it anyway. Going into the race I had the idea of attempting to run it in about 80 mins. According to my WAVA score for my other distances, this should be possible, especially as most of my training has been concentrating on longer runs. So that's what I had in my mind as a goal for the race, though it wasn't a concrete goal as I'd never gone that fast over 21.1km before. Race day came and it was a little on the cold side. This is a good sign. I definitely run quicker when it's cooler. My wife drove me to the race as she needed to take her dad to hospital, so we parked in the Sainsbury's carpark and headed to the town hall outside which the race was starting and finishing. After a little milling around I soon worked out where the baggage drop-off point was, stripped down, queued (for a long time) and deposited my bag. Due to the queue to hand in my bag I ended up having to cut my warm up short so managed to only squeeze in a 7 min warm up before making my way to the sub-90 min "pen". There weren't actual pens, but there were signs to give you an idea of where you should start in the race. At 9:30am we were sent on our way by Paralympic gold medalist Sophie Christiansen (who now has a gold postbox on Maidenhead high street outside HSBC) and into the first bottle-neck of the race: the start/finish line. The area behind the start of the race was the complete width of the street. The start/finish line was not, so the moment the gun went off, everyone was funneled into a smaller gap in order to cross the start line. As I was close to the front, there was only a little bit of elbowing, but I imagine it was terrible further back. In less than 200m we were thrown onto the High Street with a sharp left. Once again, it was a bit of a jostle and probably a bit of argy-bargy happening further back in the field. After a quick loop round town, it was down past Waitrose and under the A4/Bridge Road using the pedestrian/cycle underpass. Great idea I thought when I learnt of the route - "this way they don't need to stop traffic on the A4". However when I entered the underpass I realised this probably wasn't the best idea after all as Britain's underpasses have these lovely "anti-cyclist" barriers. Essentially metal railings set staggered across the path on the ramps into and out of the underpass that force cyclists to slow down. No problems for me as the field had thinned out nicely by the time I got to the underpass but definitely a problem when the masses come through. These barriers would force everyone into single-file to zig-zag through them. What's more, there was no warning these were coming so if you turned sharply out of the tunnel, you'd run straight into the barriers. You'd have thought they'd remove these knowing 2500-odd people would be streaming through this first tunnel within minutes of the race starting, but they didn't. Once we'd negotiated the underpass and its barriers we had a little meander through the Ray Mead/Park before we joined Ray Mead road and headed for Cookham. 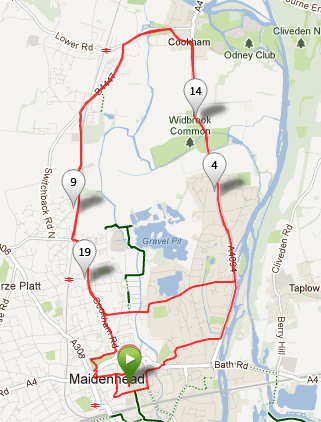 On entering Cookham, we cut up School Lane, joined the High Street, turned left into Maidenhead Road, followed this all the way back towards Maidenhead, turned left into Ray Mill Road West which then became Ray Mill Road East before joining Ray Mead Road again for the second lap. As I was sort of aiming for around 80 minutes, I set off at a good pace of around 3:46 to 3:48 a km and was chugging along beautifully with very little variation in pace. Until about 14km, which is now well into the second lap, when I a) started to get a bit bored and b) I started to over-think things. I was still feeling strong at 14km and was going well, but doubt crept into my mind. I'd never run this fast over 21.1km. I'd also not raced this far on a low-carb, high-fat diet and I started to think about the things that could go wrong like the dreaded wall to making its appearance. So as a result I slowed down to about 4:00 a km and settled in for this slightly slower pace waiting for something to go wrong. With just over a kilometer to go, we turned into Kidwells Park for a loop round the back before using another underpass to go back under the A4 and join the high street and it was about here that I realised nothing was going to go wrong. The wall wasn't going to make an appearance and I was on my way to a personal best for the half-marathon. It wouldn't be under 80 mins, but it would certainly be a PB by about 5 mins, so I picked up the pace and flew to the finish, evening finding plenty of energy to out-sprint a chap on the last 100m to the finish line (check this pic of me flying) in a gun time of 1:21:46. During our run, the start area had been transformed into the finish area with tables setup containing cups of water and probably the best thing I've seen at the end of a race in a long time: boxes and boxes of perfectly ripe bananas. What a brilliant idea, especially for a LCHF runner like me who is only going to reject, throw away or give away the usual sugary post-race choccie or "sports bar" often handed out at the end of races. Note to other race organisers: get bananas, and lots of them 🙂 . All in all, this is a good fast and very well organised race with some room for improvement, most notably the baggage drop-off and pick-up needs to be setup such that multiple queues can be used to drop-off and then pick-up the bags and something could be done to reduce the bottlenecks, barriers and sharp turns the underpasses introduce to the race.